Today, let’s talk about a simple thing you can practice on the saxophone or any instrument that’s going to help you improve in the areas that matter most, quickly. Ever feel like you’re practicing for hours and not getting anywhere? Everybody feels like that sometimes. 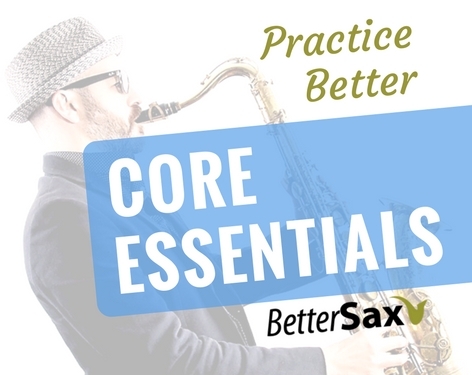 Here’s something you can add into your daily practice routine that’s going to make you feel like you accomplished something every practice session while getting better at the things that matter most as a saxophone player. We’re going to learn a melody by ear but we’re going to use this as an opportunity to focus on our technique, our finger position, our phrasing, our time feel and lots of other things. For this lesson, I chose the tune “Sunny” by Bobby Hebb to work on because the melody is relatively simple and you can play it by using the five notes of the pentatonic scale. It should also be a familiar tune to many people. You can download the backing track of “Sunny” to practice with here. Everyone at every level should be working on learning melodies by ear. If you want something more challenging, go ahead and learn “Donna Lee” be Charlie Parker or “Spain” by Chick Corea, something really technical like that. Those melodies are going to take you longer to learn, but there’s a lot to be gained from learning melodies in this way. Once you’ve chosen the melody you’re going to learn, the next step is to find the recording you want to learn it from. Don’t get the sheet music. That’s not part of the exercise and it’s not going to help you improve as a musician. Don’t get the sheet music, really. Just don’t do it. “Sunny” has been recorded many times by many different artists. I chose the original version for this exercise. Click below to listen to the original version of the song. First, you’re going to want to just listen to the recording several times to get the melody in your ear. The next step is to work out the melody note by note on your instrument. Put on the recording, play a phrase, listen to it carefully. Press pause. Sing back the note or a couple notes that you hear, then find them on your instrument and repeat. The melody to “Sunny” can be played using just the five notes of the pentatonic scale. 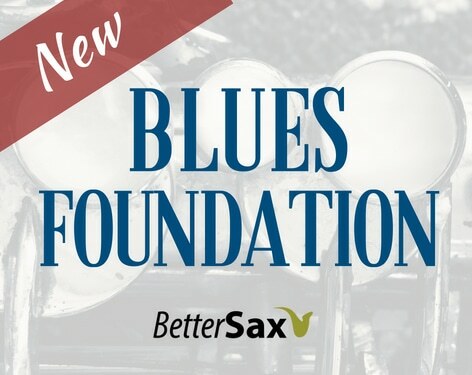 If any of this is new to you, check out the free Play Sax By Ear Crash Course to get started. 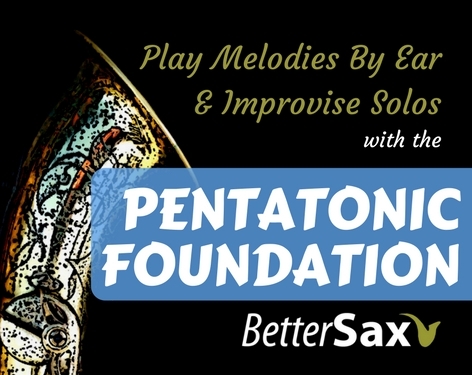 You can also check out some of BetterSax’s other videos on learning to play melodies by ear. Learn the song in phrases. Start with four-bar phrases, then eight-bar phrases. Don’t try to learn the whole song all at once. That only makes the process take longer and it’s likely to result in you making mistakes with the melody. As you’re learning these phrases, you’re going to put on the metronome and loop each phrase, focusing on your time feel and rhythmic accuracy. An important part of time feel is your finger position. You want to work on playing this melody or any melody you’re working on with perfect finger position, keeping your fingertips in contact with the key pearls all the time or as much as possible. Watch our video on finger position below. If you’re not able to play the melody in perfect sync with the metronome, no problem. Just slow it down. I’m playing this with the metronome set at 110. But if I’m having trouble playing that melody at that speed, I’m going to slow it down. I’ll slow it down to 90 or even less, 80. The important thing is getting it perfect, getting the perfect finger position, staying relaxed and really playing in sync rhythmically. Now I’m also going to be thinking a lot about my sound. If the recording we’re listening to is of a saxophone player, then great. I’m going to try and play as much like the saxophone player as I can and match his sound as much as I can. But in this case, where I’m listening to a singer, that’s great too because I can assimilate a lot of the phrasing and the way Bobby Hebb sings into my saxophone playing. Learning other musicians’ phrasing is one of the most important things we can do on the saxophone. Really, there’s no other way to learn phrasing other than listening to other players’ recordings and trying to do it. Continue in this way until you have the whole melody memorized. Once you have all the notes memorized, the work is far from done. It’s time to practice the melody over and over again with the recording. I’m going to be working on my finger technique, my finger position, my rhythmic and time feel, my sound, my phrasing and I’m just using the melody as the vehicle for practicing all of those other things. But the bonus is that at the same time, I’m reinforcing my knowledge and my ability to play that melody from memory. The way we practice scales and other technical exercises doesn’t always translate well to how we play in performance. Part of the idea behind this exercise is you want to be working on a real-world situation. You want to be working on sounding good in a performance situation. You’re not going to get up onstage in front of an audience and play your melodic minor scales in all 12 keys with the metronome on. But that’s something we spend a lot of time practicing. Spend time practicing things that are more realistic and more like something you would actually do in a performance. So start practicing melodies and focusing just on melodies. You’re going to see a big improvement. If you were to work on one melody a week for a year, at the end of the year, you’d have learned 50 melodies, assuming you took two weeks off. If you’ve tried learning melodies in the past and found you weren’t able to remember them after a certain amount of time, it’s probably because you didn’t learn them in this methodical way. You need to learn a melody slowly, piece by piece over a long period of time before it becomes part of your repertoire. Here are some additional tips to get the most out of this melody-memorization exercise. In the Bobby Hebb version of “Sunny,” he modulates three times, so he ends up playing the melody in four different keys. That’s a built-in variation on this exercise. No matter what melody you’re learning, you could add key variations into your learning. You could practice the song in multiple keys, or even all keys. Click below for a refresher on how to transpose on the saxophone, along with a free downloadable transposition guide. Bobby Hebb also changes the way he phrases the melody and even the notes of the melody from one iteration to the next. Learning how to vary melodies and embellish melodies is extremely important. There’s no better way to do that than by listening to great musicians and emulating the way they do it. Once I’ve got this version learned inside and out — it’s going to take several days or it could be weeks depending on the song — I’m going to check out some other recorded versions. For “Sunny,” there’s tons of great versions. Check out the Frank Sinatra version, which has a blues shuffle feel. If you listen to the James Brown version, he starts out as a jazz ballad. The Stevie Wonder version is amazing. Listen to the way he phrases the melody. He plays a great harmonica solo that there’s a lot to be learned from. If you make learning melodies in this way part of your daily practice routine, you’re going to be hitting all of the most important things you need to be optimizing your practice sessions. That includes listening, transcribing, technique, time feel, your sound, phrasing, pretty much everything. Oh, and build your repertoire! If you’re learning to improvise, you’re going to want to learn and memorize the chord progression for this song as well, but that’s a topic for another lesson. 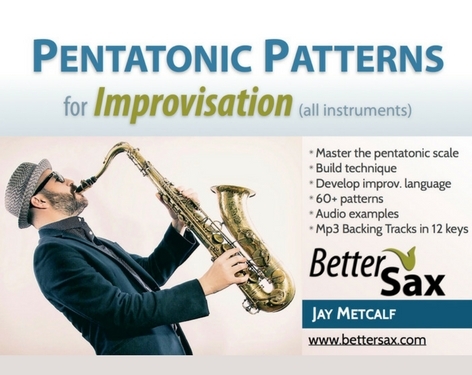 In the meantime, check out this video on improvisation for beginners you can work on. To learn a melody by ear and practice all your fundamental saxophone skills at the same time, choose a melody and a recorded version to learn it from each week. Learn the melody note by note and then phrase by phrase. Then practice each phrase over and over again with the metronome, focusing on your rhythmic accuracy, your sound and technique. Next, practice the entire melody along with the recording, matching the phrasing and embellishments. Then go listen to other versions of the song, adopting the elements that appeal to you. Work on one song in this way for at least a week before moving on to another. Make this part of your daily practice routine and you’ll see tangible results week after week. Over time you’re going to develop a long list of songs you know how to play and you will see all your other saxophone playing skills improve along the way. Don’t forget to download the backing track to “Sunny” to get you started. Be sure to let us know in the comments below which tunes you’re working on and how this technique for learning melodies by ear works for you!